1st Spring Harvesting Season from end of March to before April 5th. This particular early bud version of Bi Lo Chun demands careful brewing and will reward with a marvelous cup. In some ways Bi Lo Chun is the ‘Darjeeling’ of green tea: a bit finicky, quirky, demanding and ever-changing. But the resulting brew is worth a bit of extra attention. Try using cooler water or steep for 1 minute only and see if you prefer the results. 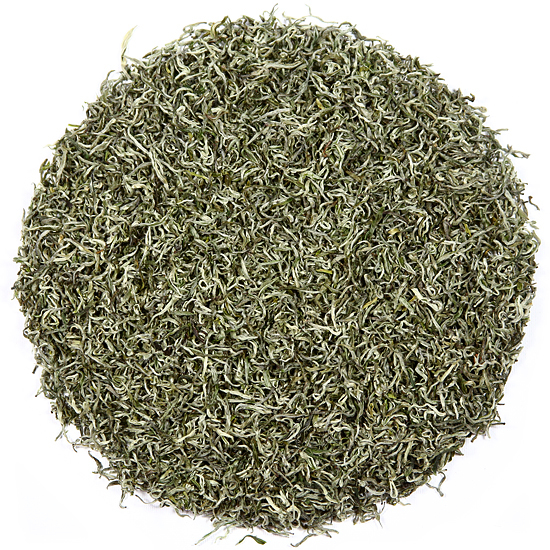 Bi Lo Chun is a beloved Chinese spring green tea. Chosen as a Tribute Tea by the Kangxi emperor in the Qing dynasty, Bi Lo Chun is a very tiny bud-plucked tea, named for its deep green color and the idea that its curled bud shape is reminiscent of the shape of a small snail. Many counterfeit ‘Bi Lo Chun’ teas are made in other tea regions of China where hand shaping skills can reproduce the look of almost any other Chinese tea. But the original, which ours is, comes from the protected environment of Dong Ting Mt. situated at the edge of Tai Lake, and has a unique taste that cannot be duplicated. Once again this season we have the 250gram, paper-wrapped option which is the ‘original’ packaging that is how tea customers purchase this Famous Tea in China. We will have several teas in this traditional packaging in our selections for 2019. Our Bi Lo Chun was plucked in mid-March 2019 and is comprised of pure spring buds that are a lovely jumble of mottled dark green and downy white buds, a sure sign of an early pluck. Once plucking begins, the size of the leaf changes quickly. There are at least five plucks of Bi Lo Chun: two or three in March (weather dependent) and two in April. Bi Lo Chun plucked in April morphs into a leaf-and-bud plucked tea (a mao jian pluck) and it loses both the appearance and sweetness that define the character of the earlier plucks. Bi Lo Chun has structure, depth & finesse in the cup. Its thirst-quenching taste is soft, both flowery and slightly fruity, with a brisk, sweet aftertaste. The aroma is pervasive, fresh, and sweetly vegetal.